Foreign direct investment in the natural resource industries is fostered through the signing of concession agreements between the host State and the investor. However, such concessions are susceptible to alteration by the host State, meaning that many investors now require the insertion of stabilization clauses. These are provisions that require the host State to agree that they will not take any administrative or legislative action that would adversely affect the rights of the investor. Arguing that it is necessary to have some form of flexibility in concession agreements while still offering protection of the legitimate expectations of the investor, Resource Nationalism in International Investment Law proposes the insertion of renegotiation clauses in order to foster flexible relationships between the investor and the host State. Such clauses bind the parties to renegotiate the terms of the contract, in good faith, when prevailing circumstances change. However these clauses can also prove problematic for both State and investor due to their rigidity. Using Zambia as a case study, it highlights the limitations of the efficient breach theory to emphasise the need for contractual flexibility. 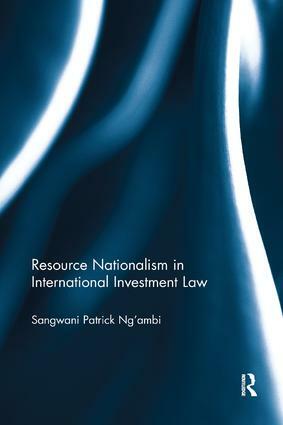 Sangwani Patrick Ng’ambi is a Lecturer in International Investment Law and Assistant Dean at the University of Zambia.